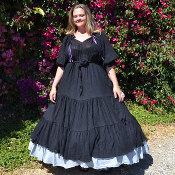 Our Black Gauze Heart Dress has a sweetheart neckline, three quarter length sleeves, and three full flowing tiers at the bottom that complete this best seller. The Heart Dress has been a main staple of Hearts Delight since the day we opened our doors. Avilabe in an array of colors and fabrics .